Like every other person that writes about Magic on the planet i want to talk up the new set and how they apply to my pet deck. Dictate of the Defecting Palm as a refresher, here is the list. My current sideboard is full of things to deal with Whip of Erebos and token makers like Hording Outburst and Goblinside. Guess i am also rocking a few Arc Lightnings. After more then a few reps with this deck over this many months, i have taken note of its faults. Namely the lack of card filtering ie the tendency for it to flood out. It is a funny balance right, you are totally dependent on this 5 mana enchantment to finish the game so you want enough mana to cast it and then win out on the back of blowing people’s mind. Or blowing our wad to stabilize and then hunting for a win con. However looking at Fate Reforged we have a great answer to not just one of issues but both! Filtering and another win con all in one. Just happens to also be immune to sorcery speed removal and if the opponent uses a removal spell on this guy then i guess i will just have to try to not piss myself laughing. 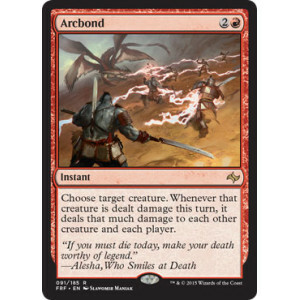 Arcbond, is also another great one. Picture this it is the end of turn 5 and you flash in Dictate on to a board full all that is left in your hand is this guy, a land and some kind of sweet burn spell. Arcbond your Rhino, Anger your team you take 12. Pass.